Snowpiercer is a wild, ambitious high concept sci-fi film. In 2031, the world is suffering from a ice age due to human meddling in the environment. 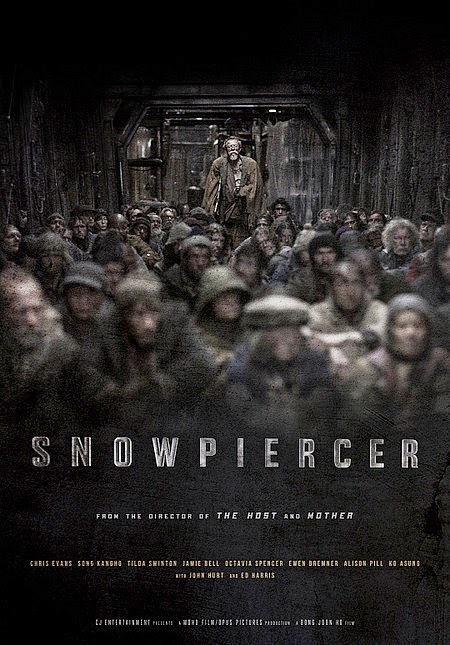 Humanity's survivors are huddled aboard a barreling train known as the Snowpiercer. Much like class segregated air travel of today, the poor ride in the back of the train, and the ride up front. It's not a revolutionary metaphor, but it's effective. In the back, under refuge camp like conditions, Curtis (Chris Evans) plans a revolution with section leader Gilliam (John Hurt). Along with a scorned mother (Octavia Spencer), a martial arts master (Luke Pasqualino) and a tweaked out electronics engineer (Song Kang-ho), Curtis makes his way forward to confront the train's designer Mr. Wilford, if he in fact exists. The crew gets bloodied as they take car by car from the wealthy. New train cars are revealed to the audience along with Curtis' band and each one reveals another layer to the train's society. Every step of the way they are chastised by Ms. Mason (a wonderfully over the top Tilda Swinton) and her enforcers. Korean director Bong Joon-ho directs the film from a screenplay by himself and Kelly Masterson. Instead of creating over-the-top sci-fi spectacle Bong instead opts (likely as a function of this not being an ultra-budget film) to create a world that feels lived in, from the gritty poverty of the tail of the train to the luxurious dining cars of the front. While many contemporary films fragment action sequences to the point of abstraction though rapid edits and shaky cam, Snowpiercer instead keeps the action grounded in the space of the train. Going though a tunnel? The screen goes black. Train goes around a turn? Characters can see each other though car windows. Even so, many big questions are raised about the functioning of this world, many of which remain unanswered. Do the rich work or merely party? How does train and it's tracks receive maintenance? Where do all the bugs come from in one gross revelation? It's puzzling such questions are left about the world, when so many small details add life to the film. An artist renders Curtis' revolution on parchment as a form of recorded history for example. An elementary school classroom car for rich kids provides a counter point, and is an excellent satire of both how history is written by the winners and how easily childhood soak it up. Plausibility quibbles aside, the thrust of the story is Curtis' drive to the front, and it works in grand action film tradition. The multi-ethnic cast is a nice change of pace from the lily white blockbusters that tend to populate the genre. Snowpiercer's anti-class warfare message isn't exactly a new one. It, however and unfortunately, remains a present message as lack of social mobility continues to plague many worldwide. Audacious, entertaining and thought provoking, action and sci-fi junkies shouldn't miss Snowpiercer.